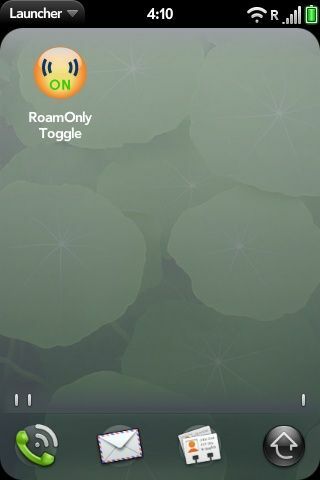 This is a very simple app which toggles the voice network between RoamOnly and Automatic. I strongly recommend also installing the RoamOnly phone preferences patch, though it is not required. Note that if you do not install the RoamOnly phone preferences patch, the Phone Preferences panel will not be accurate. This app is compatible with WebOS 1.3.5. If your phone cannot get a connection as a result of using this app, just restart the device. If the connection problem is persistent, please report in the PreCentral thread for this app. If you don't install the RoamOnly tweak, the Phone Preferences panel will not be accurate. For example, if you're in "Roam Only" mode, it will say that you're in "Sprint Only" mode. However, the top status bar will still correctly show whether you are currently roaming by displaying "R" next to the signal bars. The app's icon will toggle between "OFF" and "ON". "ON" means the voice network is in RoamOnly mode. "OFF" means it's in Automatic mode. If you change the voice network mode directly from the phone preferences screen, the app's icon will not automatically be updated. But when you run the app again, it will detect the current mode before toggling. Upon initial installation, and after resetting the device, the app icon will be blank. Also, if the phone rejects the change for whatever reason, causing an error, the icon will be blank. This app does not switch to "Sprint Only" (or "Bell Only" or "home only") mode.